The CJM knives family photo. Re: The CJM knives family photo. I'm not really sure what I'm looking at here...or what CJM even stands for. I must be out of the loop! Oh, I see: CJM as in cjm...our expert thinner! Still, a bit of blade info would be nice. 1)Cheap eBay white steel nakiri-> now a NAKUNKA! 2) my first artifex AEB-L gyuto. It once was a 240. I turned that into a bunka, the wife hated it. Off to Chris to rework the spine and profile, now the “wife knife” is one of her favorites. 3) This was an Artifex 210 mm 52100 gyuto, Chris performed the Yo to Wa conversation and thinned the blade. I installed one of my newer one piece olivewood handles. 4) this might be the crown jewel, once an Artifex Fanatic cleaver, this has been reground into a convex laser, it cuts almost as well as a shibata, but with better food release. I love the leopardwood handle. The old Richmond Artifex blades are interesting, quality steel, great profiles and Peterson heat treatment. The grind on them is designed to take a lot of abuse instead of performance but even a basic home thinning can significantly improve the performance and with an expert sharpener like Chris they turn into real premium knives that cut way above their price point. My Richmond Ultimatum rehandled by Ben and re-ground by Chris is a dream knife. Maybe we all need to push Chris to custom make some blades from scratch! I am not done with Chris either and he knows it! I need atleast one or more 240s. CJM are my initials, Joe. It seriously creeped me out when I saw that Ben knew my initials and then I realized its in my username! Thanks for the kind words, Ron. I thought your Ultimatum came out quite nicely and i'm really pleased that you agree! Thanks, Andrew! Love the car analogy. I'm super pleased your happy with my work. Thanks for all the support. Your Munetoshi should be headed home soon, then we'll start on the Kohetsu! I just want to chime in here and say that I LOVE this kind of enthusiasm and work. I've been much less invigorated by the forum lately. I'm not into the instagram-style of "discussion." I'm much more into discussing why and how any knife of any price point fits a user's needs. 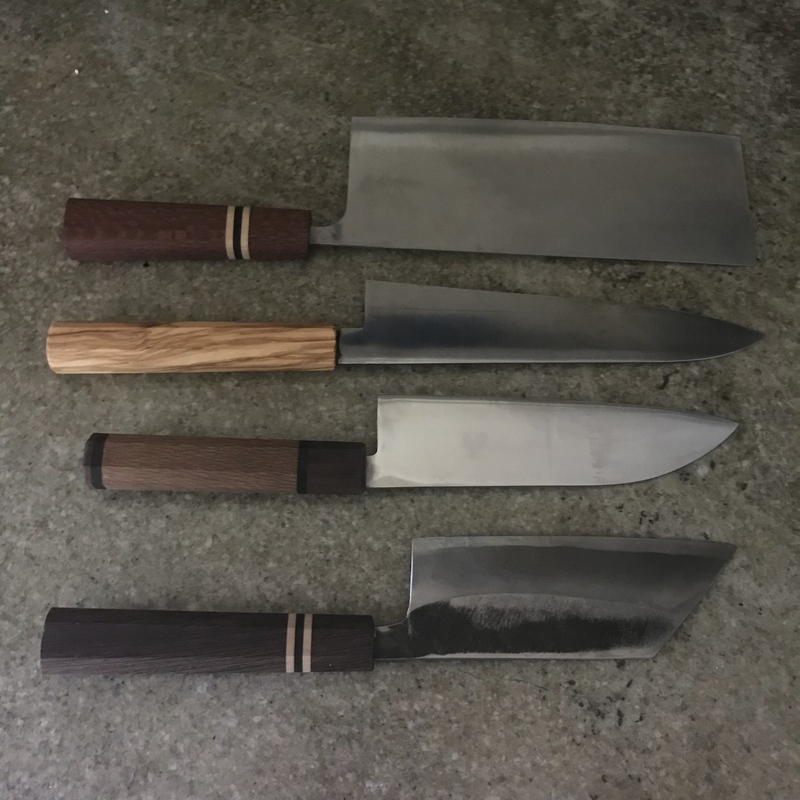 It is great to read about people making the most of knives and learning more and more about what makes a knife "good" as a result. Part of the reason I like Konosukes is because – out of all of the knives I've used and owned – I think my Konosukes are the ONLY ones I haven't had to modify in some way to make them "work" for me—one exception so far is my Bloodroot, but I may do some tip work on that one. I attribute this not to the smiths or makers, but to Kosuke—he oversees and approves every blade in relation to his preferences, and not just quality control. I think our preferences happen to match...which is not to say they do or should match with anyone else. I think the Bloodroot is probably the same—I'm certain a number of people on the forum would dislike the blade I have (regardless of its price and exclusivity), but I love it. Put another way, it isn't about the money, the cost, or whether it is "custom" or not...it is more about how you like a grind to cut and whether you can achieve that with a given blade, either stock or with a little adjustment. Otherwise, I've modified blades by T. Ikeda, Y. Kurosaki, T-F, Nubatama, Kanehide, and (at sometime in the near future), Kaneshige, among a host of other, less notable brands. I've used and owned other knives that I wanted to modify, but chose to sell instead. One of my favorite things to do is to take a knife that is 90% there and edge just a tiny bit more performance out of it by making a small tweak or two. Oddly, these knives are often my best performers, but they are also the ones which will no longer sell in today's flashier market of "like new" or "unused" collector's items. That's not to disparage that market; it is just to highlight how it is fundamentally different than a user's market, as many of those knives and sales are clearly dependent on a knife being as little used and as little modified (save for handles) as possible. Thanks, cjm[eik] for using your talents and intuitions to improve upon stock knives without over-concern for these other issues! I've always come back to either my Kikuichi super thin stuff or the Sabatiers I grew up with - one has a laser blade and the other I grew up cutting with. Bought Masamoto KS blades (not as thin or as good a grind as the Kikuichi's, not quite a true Sabatier profile), shigs, nenohi stuff, suisins .... Nothing was ever quite right and I would just buy another knife and see if it was a wall queen or a board user. Heard about thinning here and through Rick - first time I had a blade thinned and my mind is right there with yours. I like my kohetsu stuff, my one kono is a great blade, but I'm going to learn about thinning for a few years. Chris took a good knife and made it into a daily driver - still can't seem to not go to it for everything - did some lemon pasta and mani mahi for dinner tonight - only blade needed. I think I have done breakfast and dinner with just the one knife for a couple of weeks (wouldn't you know I get this one back from Chris about the same time I get my first konosuke - the kono has cut a few veggies but is not in the rotation yet) - find a person you dpcan communicate with that knows a lot more about blades than you do and let them run the show. All the worries about steel, grind, profile go away when you know find a grinder who knows what he is doing. I'll soon have a dream ultra thin nakiri back and will have the two knives I use the most as a set. And then come the Kohetsus with grind of Chris and handle of Ben - will be on display and used for Xmas Eve dinner (looks like I'm cooking for 26-32, depending on boy/girl friend attendance) and it's time for a show. A good knife can be bought, a better knife can be purchased through someone who knows you and understands what you are looking for, but great knives are personal and can only come from working outside the standard stuff. If every knife was personal and the user knew how to communicate with the builders, it would be easy. My perfect knife will have a different grind, profile, length, weight and balance than anyone else's - how I get there is a journey I am just started on. Thank you Mark for having this place. When I update this thread with the next knife, I will add before and after choil shots. In fact, let me see what I have now. The “nakunka”, please swipe right for choil shots. I still remember talked to chris when he said “let me thin that out for you.” I thought, hey, what’s the worst thing that can happen to a cheap nakiri?” I didn’t expect him to ruin me, I can’t look at knives without thinking WWCJMD. The cleaver formerly as the Fanatic, now I call it the laser cleaver. I think it has 90% the performance of a shibata, while having 90% better food release. Swipe right for the choil shots and a CCK comparison. This might be more fun than tinder for a happily married guy like myself. This was the Artifex 52100 210 mm. The choil shot here is deceiving, the heel has been thinned slightly while the grind tapers to wispy thin tip. The heel is the powerhouse, while the tip is gracefully thin. I consider this more of a KS style grind. Last edited by Bensbites on Sun Sep 30, 2018 2:10 pm, edited 1 time in total. EDIT: after disabling my extra-strong AdBlocker the IG became visible, so scratch that.